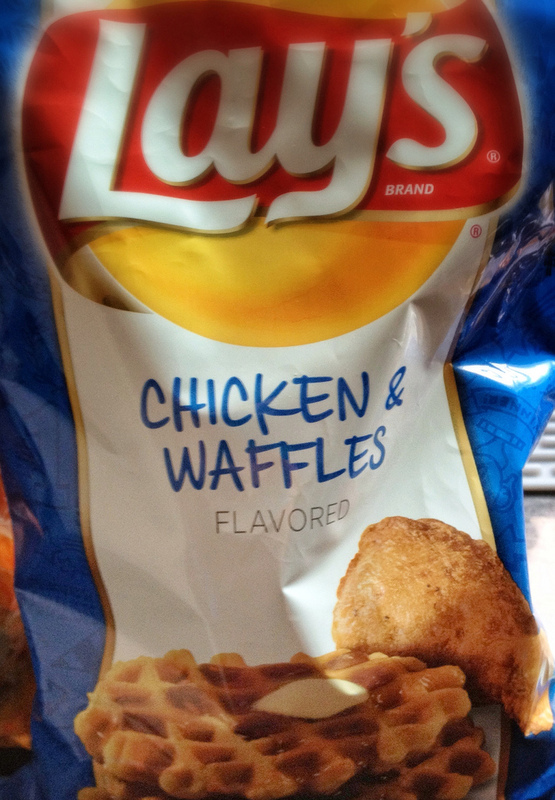 Some time ago, Lay’s started a promotion that allowed consumers to choose their new chip flavor - the options were Cheesy Garlic Bread, Sriracha, and Chicken and Waffles. Michael Symon talked them up on TV commercials while Eva Longoria ate them in colorful gowns and crowed about how tasty they were. It was very exciting and made me think of the contest M&M’s ran when I was a child to choose the new color (tan M&M, we still mourn you with every bag of candies). For a while, Daniel was absolutely obsessed with finding these chips and trying out the new flavors. Squeezing sriracha bottles is practically a hobby for him, so I think he thought it was his civic duty to try them out and vote for his favorite spicy flavor. The only thing was … these chips were nowhere. Though we saw them on TV every single night, no matter where we shopped we couldn’t manage to track the new flavors down! We tried going to different cities, shopping at grocery stores that had vast snack food aisles, we even looked on Amazon. At one point, bags were going for 70 bucks online! Clearly we weren’t the only intrigued parties. After a while, the Lay’s fervor calmed down. I still automatically glanced down the chip aisle to try and get them for Daniel, but my heart wasn’t in it anymore. We didn’t think we’d ever see the chips in person and regretted not being a part of the voting process. This morning, while strolling into Safeway, Daniel offhandedly said he wished he had at least heard who the winner of the contest had been, but neither of us had heard anything about it in months. Lo and behold, that very day as we walked past the deli we noticed a huge Lay’s display with the 3 competing flavors for sale! Though I had just started Weight Watchers 3 days ago, we snatched up the bags and promised to count chips (I ate 11 total). We were ready to conduct our very own taste test! Clearly this is the follow-up promotion -- America spoke and chose Cheesy Garlic Bread. However, we came to our own conclusions on the matter. Let’s start with the bad -- Chicken and Waffles. This was very, very bad. The chips were musty and had an unidentifiable aftertaste that made us run for a drink of water to wash it down. As soon as I took a bite, the very fake maple flavor overwhelmed me and was followed by an old, dirty flavor. Like gym socks in my mouth. I can’t believe these chips made it past the testers they were so bad. Neither of us could stomach a second chip. The customer favorite, Cheesy Garlic Bread, was just OK. It smelled and tasted just like the cheese popcorn you get in those big canisters at Christmas, but blander, with less cheese powder to leave you wanting more. I couldn’t taste the garlic at all really. It wasn’t even pleasantly salty. I thought these might taste like a cheesier version of Sour Cream & Onion, but they didn’t come close in the flavor impact. These are chips you’d eat if they were put in front of you, but you’d forget about them 5 seconds later. Our favorite did end up being the Sriracha flavor. These chips were a little spicy and a little sweet and a little garlicky. They were pleasant and I enjoyed eating them, but they didn’t taste like Sriracha. 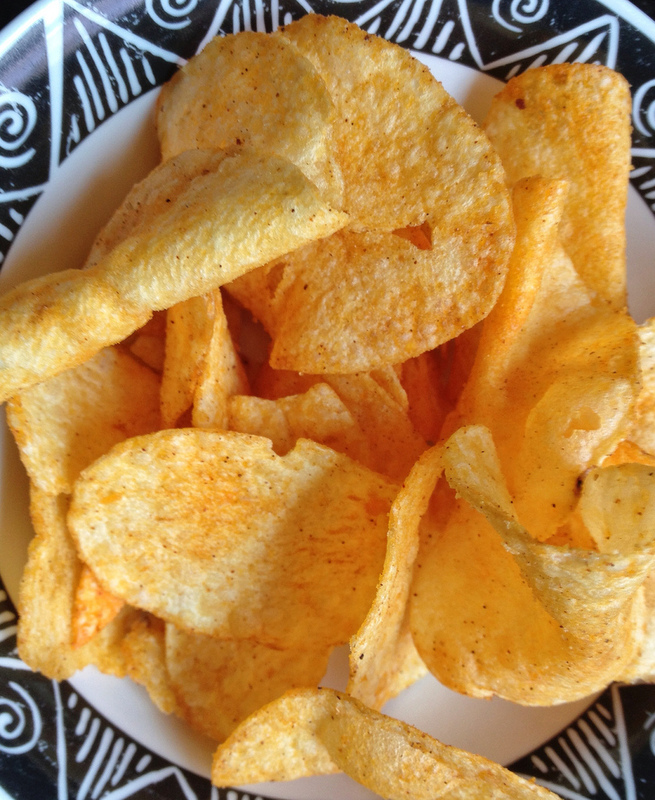 They tasted more like sweet thai chili, but Kettle Chips makes a far superior version of that flavor. These were simply underwhelming. Michael Symon and Eva Longoria, I’m disappointed in you. I hope they at least let you eat Salt & Vinegar while shooting the commercials, because I can’t imagine you’d be able to fake enthusiasm for these duds. This was not worth the wait. Sriracha chips, our reluctant winner. That's not saying much.